Not to be confused with Federation architecture. 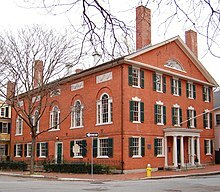 Hamilton Hall was built in 1805 by Samuel McIntire in Salem, Massachusetts. American Federal architecture typically uses plain surfaces with attenuated detail, usually isolated in panels, tablets, and friezes. 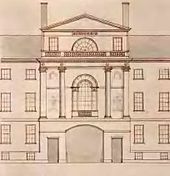 It also had a flatter, smoother façade and rarely used pilasters. It was most influenced by the interpretation of ancient Roman architecture, fashionable after the unearthing of Pompeii and Herculaneum. The bald eagle was a common symbol used in this style, with the ellipse a frequent architectural motif. The classicizing manner of constructions and town planning undertaken by the federal government was expressed in federal projects of lighthouses, harbor buildings, and hospitals. It can be seen in the rationalizing, urbanistic layout of L'Enfant Plan of Washington and in the Commissioners' Plan of 1811 in New York. The historic eastern part of Bleecker Street in New York, between Broadway and the Bowery, is home to Federal-style row houses at 7 to 13 and 21 to 25 Bleecker Street. This American neoclassical high style was the idiom of America's first professional architects, such as Charles Bulfinch and Minard Lafever. Robert Adam and James Adam were leading influences through their books. 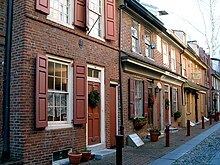 In Salem, Massachusetts, there are numerous examples of American colonial architecture and Federal architecture in two historic districts: Chestnut Street District, which is part of the Samuel McIntire Historic District containing 407 buildings, and the Salem Maritime National Historic Site, consisting of 12 historic structures and about 9 acres (4 ha) of land along the waterfront. Modern reassessment of the American architecture of the Federal period began with Fiske Kimball, Domestic Architecture of the American Colonies and the Early Republic, 1922. ^ The design vocabulary of Federal architecture is accessibly illustrated and contrasted with Greek Revival in Rachel Carley, The Visual Dictionary of American Domestic Architecture 1994, ch. 5 "Neoclassical Styles", p. 90ff. 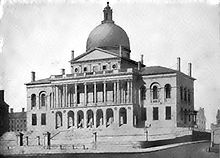 ^ For the federal government's role in Federal architectural style and its symbolism, see Lois Craig, ed. The Federal Presence: Architecture, Politics and Symbols in United States Government Building (Federal Architecture Project, Cambridge: MIT Press) 1978, chs. 1–3, with brief text and extended captions to multiple illustrations. ^ Creating Your Architectural Style. Pelican Publishing. p. 89. ISBN 978-1-4556-0309-1. ^ It "established a generation ago a scholarly basis for subsequent study of early American architecture", observes Hugh Morrison, in the Acknowledgments prefacing Early American Architecture From the First Colonial Settlements to the National Period (1951, repr. 1987), p. xiii. Craig, Lois A., The Federal Presence: Architecture, Politics and National Design. The MIT Press: 1984. ISBN 0-262-53059-7. Federal Style Patterns 1780-1820 Bibliography for federal style research, photographs of federal houses, federal style pattern book. This page was last edited on 28 March 2019, at 00:55 (UTC).